Questions about the candidates? Check out the televised City Council debates in Wards 2, 4 5 and 6 and the School Board election at this link! 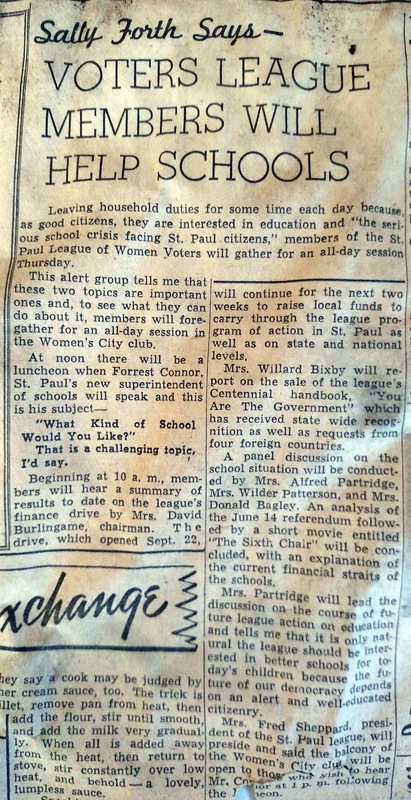 Check out this St. Paul Dispatch article about the League of Women Voters St. Paul from 1949!! The article was found in a wall during a renovation. Photos from 65A Candidate Forum held on Oct. 29, 2014. LWV St. Paul has developed an excellent voter guide available here for download. Share far and wide to help educate voters on the candidates running for office. Be sure to share this report on the Comparison of Voter Turnout by St. Paul Planning District by Type of Election by Selected Demographics 2010 & 2012. The report compares turnout for state, federal, and county commissioner races. It may come as no surprise that the lowest turnout is for the commissioner races. Yet, the county controls so much of what affects people's daily lives such as roads, parks, libraries, water, sewer, social services, judicial services, law enforcement, and on and on. County commissioner races are regularly uncontested with residents being unaware of who is running and what they stand for. Let's work to change this! LWV St. Paul hosted an excellent panel discussion on Campaign Finance in early September. If you weren't able to attend the event, be sure to watch the video. The Ramsey County Elections Office will be open to all voters who wish to vote early in‐person for the 2014 state general election on the following schedule. Voters in suburban Ramsey County (except Falcon Heights) may also vote early in‐person at their city or town halls. Please contact your city or town for specific dates and hours.